2013 was a good reading year because I was able to discover new and fantastic authors. As seen from the image above, I have listed these authors (in no particular order of preference). This is the year I discovered the great Haruki Murakami. I read his memoir “What I Talk About When I Talk About Running“. At that time I didn’t know how popular Murakami is. I was looking for some books about running and I happened to come across this book. I went on to read four more books from him this year. I am currently reading “A Tale For The Time Being” by Ruth Ozeki. I’ve read the first few pages of the book and I have this feeling that I’m going to really like it. One of my favorite books this year is “The Humans” by Matt Haig. He also wrote “The Radleys” so I’m going to check that out soon. Maria Semple knew how to make me laugh in her book “Where’d You Go, Bernadette”. Maria Semple is witty and funny and I thoroughly enjoyed reading that book. I am not kidding when I listed Neil Gaiman in the above list. I didn’t know he was the author of Coraline, which I only watched but never read. I’m glad I was able to discover his magic by reading “The Ocean at the End of the Lane”. I plan to read “American Gods” soon. No book has ever made me laugh like “The Rosie Project” by Graeme Simsion. Of course, it’s in my favorite books of 2013 list but that’ll come later. He’s hilarious, I tell you! Don Tillman has got to be my favorite fictional character this year. Alan Bradley is the author of the Flavia de Luce series. I read the first book “The Sweetness at the Bottom of the Pie” because all that chemistry and intelligence made me curious. Also, I wanted to see how smart Flavia is. Turns out she is incredibly smart and witty. I absolutely loved that character. Will I touch another Flavia de Luce book? Are you kidding? Of course I will! I enjoyed reading “The Sound of Things Falling” by Juan Gabriel Vásquez. He writes beautifully. Jan-Philipp Sendker‘s “The Art of Hearing Heartbeats” was exceptionally good. I absolutely loved the story and characters. I am looking forward to reading “A Well-tempered Heart”, the sequel of this book. Khaled Hosseini is no doubt a popular author. So when I read “A Thousand Splendid Suns” this year, I slapped my forehead and exclaimed, “Why didn’t I read this sooner?” I loved the book so much. Khaled Hosseini can now include me to his increasing number of fans. Categories: Book Reviews | Tags: Alan Bradley, Graeme Simsion, Haruki Murakami, Khaled Hosseini, Maria Semple, matt haig, Ruth Ozeki, Thousand Splendid Suns, top ten tuesday | Permalink. Lucky, lucky you, just discovering Murakami. You have many more of his to find and read. Here’s my Top Ten New-to-Me Authors. Thank you! You’re right! So many more of his books to read! I REALLY need to read a Khaled Hossini book. Great list! I love Khaled Hossini. I’m glad you discovered Hossini this year. Great list! A very impressive list. And I enjoyed your commentary. “Book drunkard” … that’s brilliant!!! Hahaha! The book drunkard, at your service ;) Thank you! I’ve heard of What I Talk About When I Talk About Running because I was looking for running books too. I didn’t know the author was so popular. Have you heard of Running Like a Girl by Alexandra Heminsley? It looks like a really great book about running. I love the way you did your post with a banner! So smart! Love Haruki Murakami! I struggled a little with Maria Semple, but only because the novel was epistolary, and I struggle with that type of writing, I’ve discovered this year. I also had struggles with RECONSTRUCTING AMELIA, THE PERKS OF BEING A WALLFLOWER, and ATTACHMENTS. It’s obviously me! Glad you discovered Neil Gaiman, too!! Try out STARDUST! Oh, I started reading Khaled Hosseini this year, but didn’t get a chance to finish! I must!! 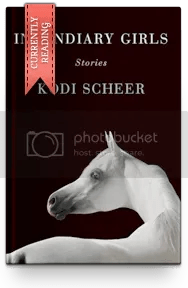 Just discovered your blog today and love it. Murakami is one of my new favorites this year too. I read one of his books earlier, didn’t like it. And this year, I tried Hard-Boiled Wonderland and the End of the World and absolutely loved it. Thank you so much for your visit and for leaving a comment :) I have not read the books you mentioned but I’m definitely going to read another Murakami book next year! I discovered and loved Murakami this year too! I started 1Q84, which I would guess is quite different from his memoir, but I’d be interested in his memoir too. I can’t imagine any of his books aren’t beautifully written! Ruth Ozeki is one of my new-to-me favourite authors this year. 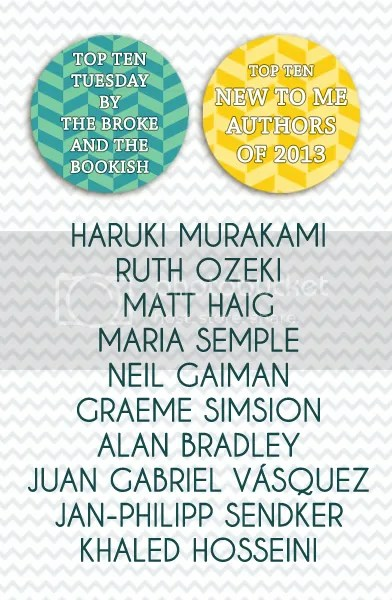 Murakami would have been in my list last year had I written one! That’s great to know! I just finished reading A Tale For The Time Being yesterday. I feel that I have to collect all my thoughts before I share what I thought about it. The quantum physics stuff in the book fried my brains! Which isn’t a bad thing. I plan to read more Murakami books next year. How about you?